Emagpromotions allows anyone from self publishers to publishing houses to create and publish their works in electronic format. These publications are fully interactive with links to video, websites and other interactive elements embedded into the publication. Welcome to the first edition of A Barbadian Book of Poems and Puzzles. 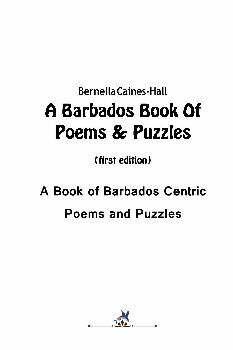 This book is an eclectic collection of Barbadian poems and puzzles, penned mainly by friends, family and supporters of The Peoples Cathedral Primary School located in Barbados. This initiative was conceptualized to reawaken the art of poetry writing, bring to the fore topical issues that are a part of the social fabric of the society and lay the foundation for a national competition to showcase the diverse categories of poetry that are penned daily by many Barbadians in all strata of the society. The puzzles present a fun, exciting, yet relaxing way of learning about Barbados’ history. They cover numerous themes including but not limited to sports, culture, national heroes, flora and fauna, civics and general brain teasers. An electronic version of the book which contains all of the answers to the puzzles, plus some sample poems is a companion to this physical book.